The 31st Annual Tiffany Awards was held Saturday, August 25, 2018 to recognize the performances and achievements of TCP members and volunteers. The Tiffany Performance Awards are named after the late Marion Tiffany, an actress, volunteer and charter member of Twin City Players. TCP members and pass holders nominate candidates to ten different categories, including leading actress, supporting actor, and more from the season’s six mainstage shows. A secret panel of judges selects each year's winners. Backstage and volunteer contributions also are recognized with various special awards. Some of this year's Tiffany Award Winners! 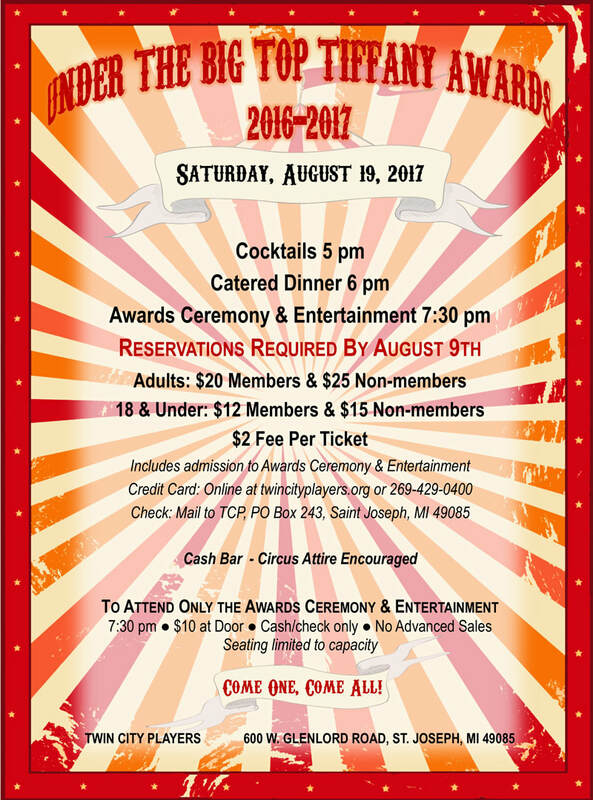 The 30th Annual Tiffany Awards was held Saturday, August 19, 2017 to recognize the performances and achievements of TCP members and volunteers.